- On the other hand, the rest of european markets suffered with the economic crisis, with the german plug-in market shrinking to just 125 units, far below than the usual 400 units sold last year, and falling behind China (#6) and Sweden (#7) in the countries ranking. 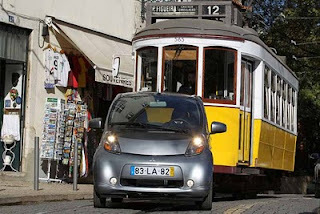 One thing is compiling numbers of electric car sales, another is to see them live in the middle of traffic and see how and where they interact with the remaining vehicles, so i've written this post to illustrate how EV's stand in Portugal, my home country. Renault Twizy - Last year's best seller, this quirky vehicle draws as much attention as a Lambo, so it's easy to say that this isn't for everyone, and with a limited range of 80 - 100 kms it's clear where it is aimed: Megacities, in this case, Lisbon, where they start to appear here and there. Outside the nation's capital i've seen four red Twizy's parked just outside Óbidos, an historic village 90 kms north of Lisbon, belonging to a company called Zero CO2 Tours, a rental company focused in promoting the surrounding area through tours and other services using EV's. Interesting, eh? Nissan Leaf - With more than 120 units sold, this is the most widespread electric car in Portugal and the only to be seen outside major cities. Supported by the government at the time of launch with some units, like the one on the picture above, being bought by public institutions, this was the model that suffered the most with the end in 2012 of the 5.000 € electric car subsidy, this is why most Leaf's here are from 2011. On a side note, this is a car favored by females, as most drivers i saw in them were women. Mitsubishi I-Miev family(1) - The japanese firm did a lot to publicize EV's to private buyers in early 2011, reason why these are seen in cities where greenies and new tech addicts live. The age and driving habits vary a lot with these models, for example i saw a retired men driving one at 40 kms/h in a clear two lane street in Aveiro, but in Coimbra i also saw a college guy driving a C-Zero like a hooligan and passing everyone it could in a crowded street, back then i remember thinking: "This guy must be thinking he's driving a Porsche 911". Smart Fortwo ED - The only electric car to register a sales growth in 2012, the tiny Smart ED is bought mainly by companies willing to have a green halo or municipalities. At first seen only in Lisbon, now is starting to spread to big cities in the north like Oporto or Braga. Others - The remaining models sold have symbolic presence, the few Chevy Volts, Opel Amperas and Prii Plug-In i saw were demonstration cars, so Plug-In Hybrids still have a long way to go to make their presence felt here. It looks that the german plug-in cars being previewed on the next Geneva Auto Show are originating a wait-and-see attitude on german consumers, January marked the fourth consecutive down month, with the Teutonic EV market shrinking to just 125 units sold on the first month of the year, down from the 356 sold last October. The Opel Ampera took the Twizy misfortunes to achieve the first place, something it failed to do since the arrival of the french quadricycle. Rounding up the podium was the Nissan Leaf, an habitué here who was also far away from its best performance (96 cars last October). 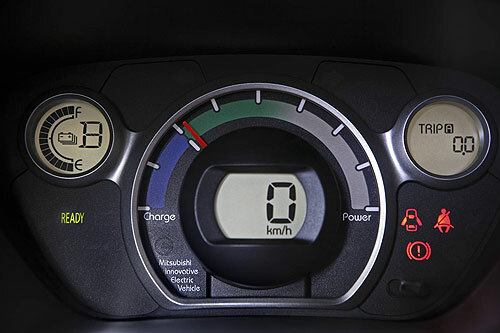 Kangoo ZE dashboard: Simple, functional, just like an LCV should. At 756 units sold, the french market had a 28% monthly increase in January, thanks to a great month of the Kangoo ZE, selling 444 cars and achieving a whopping 59% market share. Below the french LCV, the Zoe already comes in second place at 70 units, although most of them are only demonstration cars, according to Renault the first real sales month for the supermini will be March. In third comes the Nissan Leaf, with sales rising to 60 cars from the 34 sold in December. Further down the ranking, the Renault Twizy plunges to #5, the Peugeot is also down to #10 and the Fluence ZE confirms their bad performance, selling just 2 units in January. With 2013 data is coming in at a slow pace, i took the time to see how it measures the all time ranking for EV's and the Top 10 models are a diversified bunch: From old timers dating back to the first electric era, like the Peugeot 106 Electrique at #7, to shiny new cars like the Tesla Model S already at #9 and looking for better standings in the next months, or from the usual electric ambassadors (Volt, Leaf, Prius...) to unsung heroes like the tiny indian Reva. There's also space for some french quirks, like the quadricycle Renault Twizy and the LCV Kangoo ZE at fifth and sixth places, and the surprise of seeing the Smart Fortwo ED at #10. Just outside this All Time Top 10, but now a regular presence in the monthly Top 5, it won't be long for the Ford C-Max Energi to reach it, making it the third Plug In Hybrid in the ranking. (2) - Also includes Citröen C-Zero and Peugeot iOn sales. At 118 cars sold in January, the canadian plug-in market had a stable market, with the two top models maintaining their positions despite a weak month from the Volt. January was a record month for the Prius Plug-In with 33 sales, enough to remove the I-Miev from #3 and close in on the top two. Speaking of Mitsu's small electric, its first month of the year was horrible, selling just 4 cars. Pl Canada Jan YTD % '12 Pl. At 124.207 EV's sold, 2012 doubled sales regarding '11 and a lot has happened since then, beginning with a new best seller crown bearer, with the Volt family removing the Nissan Leaf from the top spot, thanks to tripling sales in the US, now the largest EV market by far. 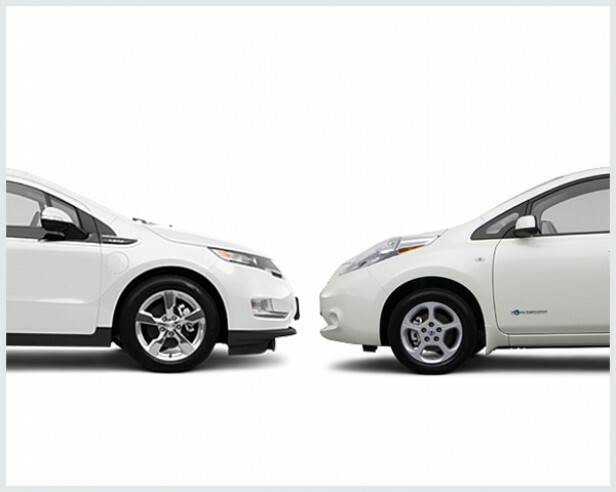 Despite a recovery in the last months of 2012, Nissan's electric couldn't help dropping to third, losing the silver medal to the Prius Plug-In, making it a great landing year, especially considering that it was only available on the second half of the year in most markets. Thanks to strong initial sales that lasted through the summer, the tiny Renault Twizy secured a brilliant fourth place, even outselling the I-Miev family, 2010's best selling electric car. Beside the Twizy, contributing for Renault's fourth place with 14% share in the manufacturers ranking, comes the Kangoo ZE (#6) and Fluence ZE (#9). Already showing up in the Top 10 and despite being sold only in the final months of the year, both Tesla Model S and Ford C-Max Energi look to 2013 with eyes on the top spots and promising some headaches to the podium bearers. Further down the ranking, we welcome two newcomers, the Toyota RAV4 EV (#20) and the Roewe E50, to be noted that the chinese model had only December as a full month of sales, but it was enough to put it in #19. As a curiosity, 2012 was the first year that Plug-In Hybrids sold more than pure BEV's, although the difference between them wasn't significative (less than 200 units). Despite a sharp decline (41%) regarding last December, truth is that at 4.593 units sold, January represented a three fold surge over '12 January, a sign that we should see a 100K plus market in the year end. Tesla shot up to #1 with at least 1.200 sales, taking advantage of their competitors shortage of stock (Volt, Leaf), or bad months (C-Max, Prius). Nevertheless, only the Nissan Leaf sold less than the year before, with every other model increasing significantly their sales. With an enormous waiting list, it's looks that Tesla will become the expected surprise of the year, even if it won't repeat last months feat. January was a record month for Plug-In cars in Sweden with 174 units sold and possibly the first time that the EV's got more than 1% share in the general market. The Volvo V60 Plug-In is building momentum since it was launched in November, rising now to #2, just five cars behind the Prius, so it won't be a surprise to see soon a new leader in the swedish models ranking, which would be a comeback for the home maker since the first place in 2010 of the C30 Electric, this month that goal already has been achieved as a brand, Volvo got 35% share against 33% from Toyota. A good month too for the Nissan Leaf at 29 units, enough to pass the Renault Kangoo ZE and break into third position. Pl Sweden Jan YTD % '12 Pl.